Hello everyone! It's Alison (butterfly) here, and I'm really excited to introduce you to our new-look Destination Inspiration posts. Each month, four Creative Guides will play with the same set of ingredients as each other, and cook up four (hopefully) very individual creations to inspire you. There are four of us playing in March - with one project revealed each Monday. And there'll be a fresh team of four Creative Guides each month, and a fresh list of ingredients too. Don't worry - you'll soon get into the swing of it! Instead of using my Spritz and Flick technique as my background, I actually used it to create my Umbrella Man. I applied my Peacock Feathers ink to Distress Watercolour Paper, which gives a really strong effect to the water droplets you flick at the ink. ... an effect I particularly like on the umbrella! I painted a thin coat of gesso onto my manila tag, and then blended on some more Peacock Feathers for the sky. The gesso really softens the intensity of the colour so you get a delicate, pale shade. But I then spritzed some Distress Spray over the top, to get some more colour and to give it a lovely spritzed splatter texture. No surprises that I chose some greens to accompany my Peacock Feathers - Mown Lawn and Peeled Paint are here, both blended on and used to stamp some of the meadow grass layers. 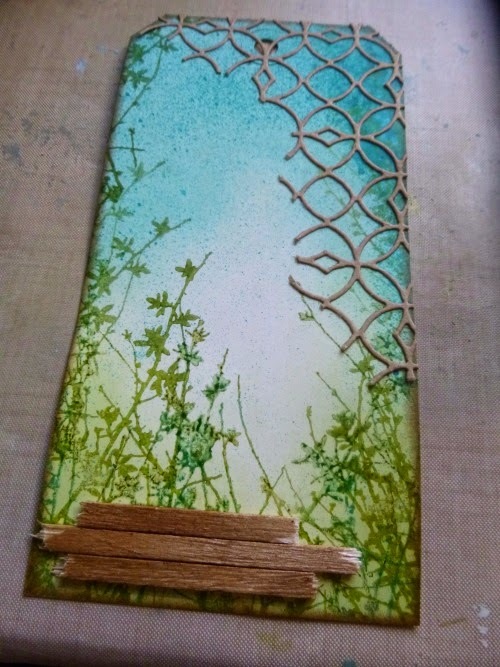 I also layered some more stamping using Archival inks in Olive and Leaf Green. 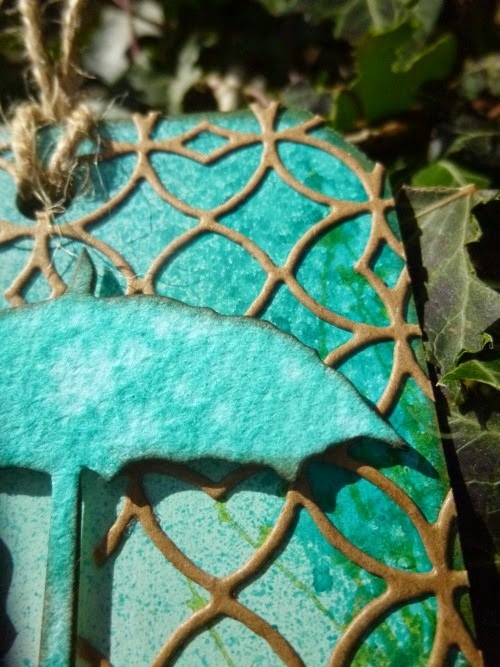 I couldn't resist using my new Mixed Media Thinlits, simply cut from kraft card and trimmed to fit the tag. 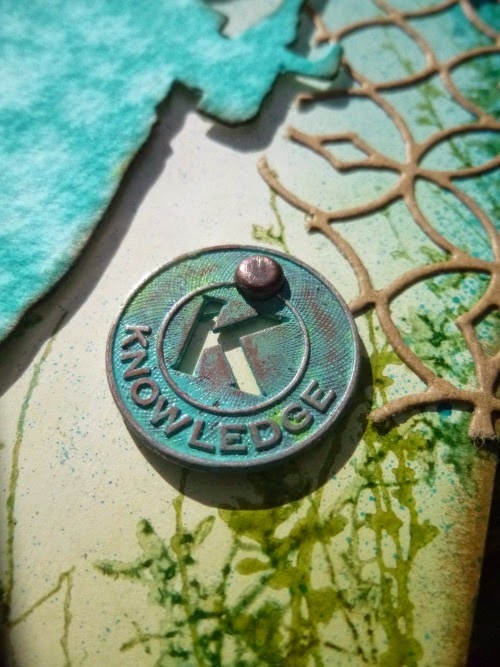 I love how delicate it is - and given this design is my most-used stencil from Tim's collection, I'm thinking this die will get lots of use too! It's a happy coincidence that it ended up over the darker spritzing, but the contrast works really well I think. To give Umbrella Man somewhere to stand, I've used a coffee stirrer "liberated" from Tim and Mario's favourite coffee shop. I inked it with Vintage Photo and a bit of Coffee Archival and snapped it in pieces, so it would have nice rough edges. I added some extra shading under his feet with Distress Markers to ground him properly. And for my final ingredient - the Idea-ology Metal - I've used one of the Muse Tokens, altered with Distress Paints, mainly Peacock Feathers of course, but also a touch of Mown Lawn in the mix. Well, that's the first of our Destination Inspiration posts for March. I hope you like it, and I hope you like the idea of this new game. Do let us know... it's always great to hear what you think. So, who will it be next? And what will they come up with when they combine these same ingredients with a little touch of their own special magic? You'll just have to come and find out next Monday! If you can't stand the suspense, why not spend the time in between creating an Anything Tim project to come and play along with our birthday challenge?! Don't forget that as well as the prize voucher from our generous sponsor Country View Crafts, there are other goodies on offer this month too, including fantastic prizes provided by Tim and Mario. See you there! Oh - I do LOVE your tag Alison! Wonderful use of the March ingredients! 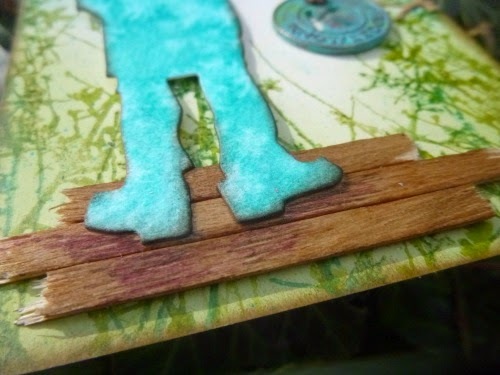 Your wooden floor for Umbrella man to be standing on is SO creative!! 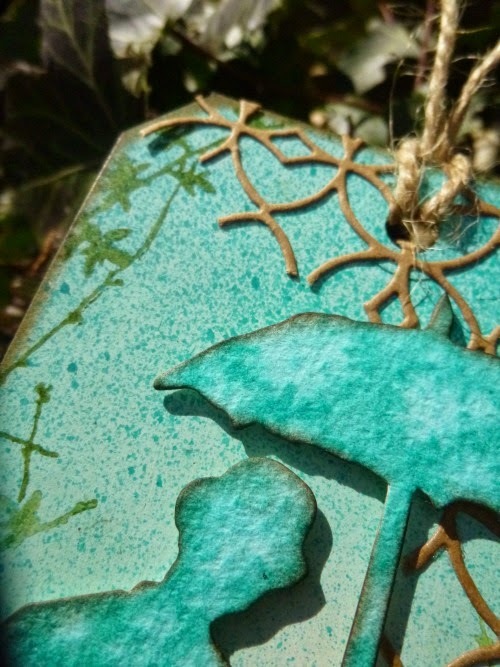 beautiful use of your new thinlet die and the foliage stampings! Lovely tag Alison. Love the water effect on the man and the way he us grounded! The thinlits due is a super add and of course the color is bright and beautiful. 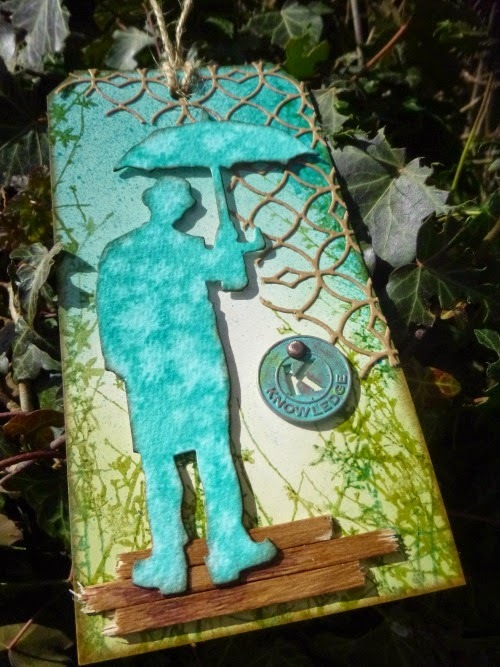 Wonderful tag Alison, the rain/cloudy effect on your umbrella man and the background is wonderful. 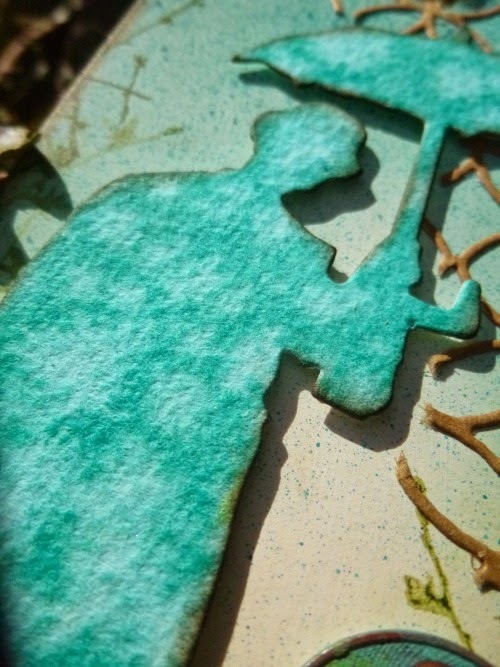 Will have to investigate these new Thinlits mixed media dies, love how delicate it is! Can't wait to see what the talented DT comes up with next using these four ingredients. I love your tag,Umbrella Man looks particularly good today!! I've just got hold of that much sought after die, and can't wait to use it. I think the new way forward for AVJ will be really interesting. This is fabulous! I love the colors and all the texture. Fantastic tag Alison and so well explained. Your umbrella man looks super. TFS. Wonderful introduction into the new DI, Alison! 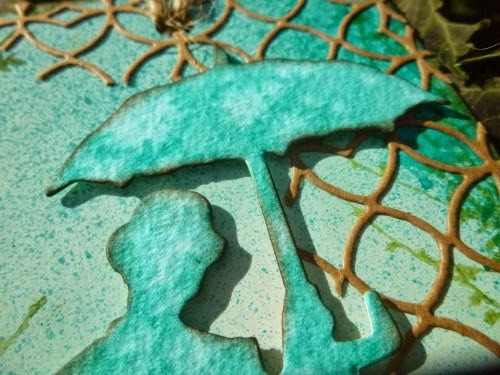 Love the umbrella guy inked on the watercolor paper, so stunning is the effect! This is a gorgeous tag and love it to pieces. Can't wait to see the next DI up to bat! Love this! Oh, I do love this tag! Alison, it is wonderful. The bright colour tones, of spring,-the diecut , metal medal, and the broken stirrer ,-a few things which together gives a fantastic effect. The splatting effect is wonderful with the Peacock Feathers. A beautiful tag from your ingredients, Alison! Love the splotchy look created from your flicking technique on our second favorite man! hehe Nicely choreographed, my friend! stunning & thank you for the break down of products. Thanks Allison for being the first brave soul to step into the new way of doing things. 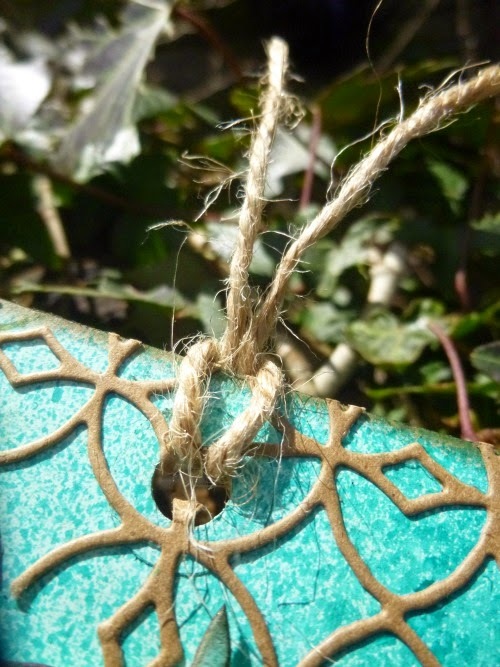 Your tag is simply beautiful! Great explanation too. Love your umbrella man with my favorite Tim Technique! Can't wait to see what everyone else comes up with. Awesome tag! Fabulous tag! 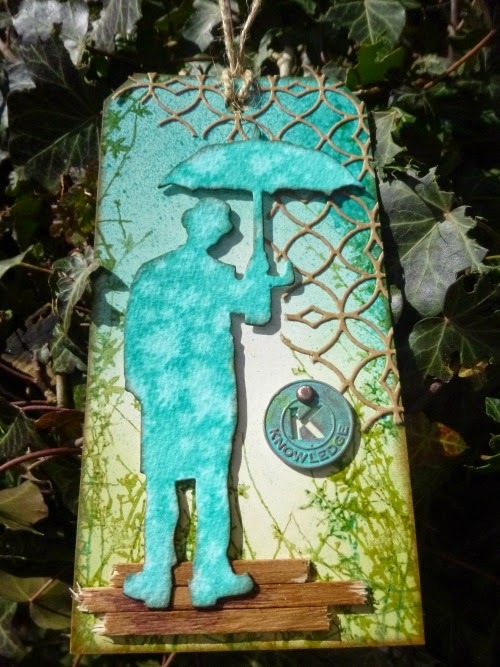 I love your umbrella man and the mixed media die! Amazing colors and background! The results of your cooking are superb. I love the colours and layers. Thanks for starting off the new look DI posts so creatively. Ohh I missed this post earlier. It is great to know, we will be getting these wonderful art recipes every Monday by you all talented ladies, that will be great start for a week. Alison, as always, love to read your words! Tag is awesome with beautiful thoughts behind them. spritz and flick technique looks great on Umbrella man. Beautiful addition of die cuts and ideology metal. Would love to work with this recipe.